"In 1776 Pittsylvania County and Camden Parish were organized and at the first meeting of the vestry, held June 21, 1776, at the courthouse, there were present the following vestrymen, 'who subscribed in the Vestry to be comfortable to the doctrine and Discipline of the Church of England as by law Established: John Donelson, John Pigg, Hugh Innes, George Rowland, Crispen Shelton, John Wilson, Peter Perkins, Abram Shelton, Theophilus Lacy, Robert Chandler, and William Witcher' "
"While the Virginia troops were still in their entrenchments at Gwynn's Island an express arrived from the governor ordering them to march at once against the Indians along the western frontier. The inciting of the Indians to their barbarities against defenseless frontiersman is the darkest blot on England's fair name during the Revolutionary War ... "
"Virginia sent a force of 1,600 men against the Cherokees, while North and South Carolina sent out expeditions at the same time. Virginia's troops rendezvoused at Long Island in the Molstein River, where in the early summer a fort had been erected and named Patrick Henry in honor of the newly elected governor ... "
"The Cherokees lived on the Tennessee river, and all things being in readiness on October the 1st, the troops set out from Fort Patrick Henry for the march of 115 miles through the wilderness to the Indian towns. 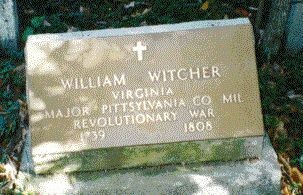 Captain William Witcher was left with a guard of 200 men for the Fort." "Indian outrages continuing along the frontier, the states forces were ordered to take the field in another Indian expedition in 1777. Two companies from Pittsylvania marched in this campaign, one commanded by Captain John Donelson, ...; ; the other was commanded by Captain William Witcher. ; Both rendezvoused at Pittsylvania Old Courthouse (Callands) in the month of March 1777." "General Nathaniel Greene assumed command of the Southern Continental Army in the autumn of 1780 at Millsboro, North Carolina, and Virginia at once sent re-enforcement's. Several companies of militia marched from Pittsylvania that autumn and winter. Captain John Winn commanded a company ... Captain James Brewer a company ... Captain William Witcher a company ... Captain Isaac Clements a company ... Captain Joshua Stone a company ... "